Parking: Parking areas along the lane by the Abbey (grid reference SE 575 848). Rievaulx Abbey was the first big Cistercian church to be built in England, begun in 1131 and almost fully completed by 1175. It is set in the beautiful Rye Valley, and the surrounding hills and trees, along with the village of Rievaulx itself, add to the beauty of the setting. Rievaulx Terrace above the Abbey, with its half a mile of lawn and classical temples should also not be missed, if only to find the best views of the Abbey. At its peak the Abbey housed more than 600 monks, but slowly declined, and in 1538 at its dissolution only had 21 left. Start on the road in front of the ruins of the Abbey and head towards the village of Rievaulx with the River Rye on the left. After about one hundred yards where the road bends, turn left through a gate into a yard following the sign for Bow Bridge. After a few more yards pass through another gate then along the track over a narrow stream, then through a further gate before pulling in alongside a hedge a few yards further on. Do not go through the wooden gate at the start of the hedge / fence, but continue along the gravelled path down the left hand side of the hedge now heading away from the Abbey. The hedge runs parallel with a shallow canal that is still just visible which was built by the Monks to supply water to the Abbey. Pass through a small wooden gate by the side of a larger gate a further one hundred yards on then continue ahead on the same line before passing through another wooden gate just before reaching the River Rye. Head along to the right of the river for a couple of hundred yards and turn right at a yellow way marker and up the five steps and over the stile out on to the road. Turn left along the road and proceed over Bow Bridge. As the track starts to enter the woods, a further one hundred yards on, turn left through a wooden gate following the brown footpath sign for Ashberry. Follow this grassy path in the direction of the Abbey, over a wooden stile, then through a gate before it starts to slowly climb as it enters the trees of Ashberry Wood. Over to the left there are views through the trees over to Rievaulx Abbey and to the classical temples on Rievaulx Terrace on the skyline above it. The path eventually flattens and descends to pass out through a gate and then twenty yards further on out on to the road. The path downwards reveals views over parts of Ryedale. Turn left, immediately passing over a red bridge, before turning left again following the road signs for Helmsley 3 miles and Rievaulx ¾ mile. 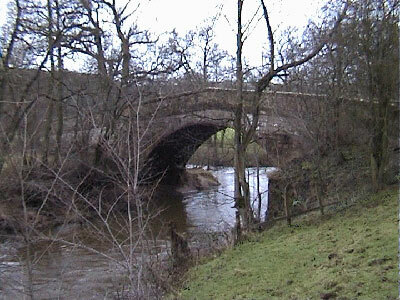 After a couple of hundred yards go over Rievaulx bridge and turn left following the road sign for Rievaulx ½ mile. Follow this road back round now to the front of the Abbey.